Calm just-shaven skin with the Zirh Post-Shave Solution; a lightweight, fast-absorbing moisturiser that works to restore a cool, comfortable complexion. Harnessing the powers of Aloe Vera, Glycerin and Passion Fruit Extract, the non-greasy aftershave delivers long-lasting moisture and hydration, whilst relieving redness, razor burn and irritation caused by shaving. Expect soft, smooth and conditioned skin. Use immediately after shaving. Smooth a small amount over just-shaved skin areas. Do not rinse. Water (Aqua), Caprylic/Capric Triglyceride, Glycerin, Myristyl Lactate, Neopentyl Glycol Dicaprylate/Dicaprate, Polysorbate 20, Glyceryl Stearate, Glyceryl Stearate Se, Isostearic Acid, PEG-100 Stearate, Cyclomethicone, Cetearyl Alcohol, Phenoxyethanol, Ceteareth-20, Dimethicone, Methylparaben, Tetrasodium EDTA, Propylparaben, Bisabolol, Sodium Hyaluronate, Propylene Glycol, Acacia Senegal Extract, Aloe Barbadensis Leaf Extract, Macrocystis Pyrifera Extract, Agrimonia Eupatoria Leaf Extract , Ulva Lactuca Extract, Plantago Lanceolata Leaf Extract, Passiflora Edulis Fruit Extract, Chondrus Crispus (Carrageenan) Extract, Cinchona Succirubra Bark Extract, Panax Ginseng Root Extract, Camellia Oleifera Leaf Extract, Chamomila Recutita (Matricaria) Extract. I first discovered Soothe on a trip to New York in 2001 and have been buying it here in the UK ever since. Having sensitive skin, I find this the perfect post shave lotion. It is soothing and not at all greasy and I use it after shaving with Zirh Shaving Gel which I also thoroughly recommend. This is one of those rare products that actually works. It smells great, prevents any kind of stubble rash (in my experience) and lasts forever. Mine lasted for months. Highly recommended. No need to worry about that shave rash! I love this product. I'm a big fan of all the zirh products but this has to be my favourite. After shaving day after day my neck can become really irritated but this product sorts that all out for me. 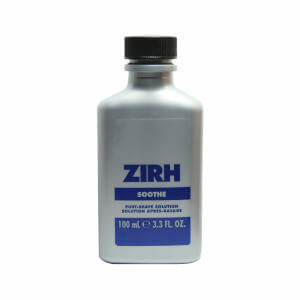 I never suffer from stubble rash now thanks to Zirh. Smells so good too. Nice fresh tingle afterwards. For a very fluid soother this is really effective - a little goes a long way and it certainly helps stop razor burn and redness. I thought this product was supposed to calm razor burn and sooth the skin? For £22 there are dozens of better products out there. Back I go to the best... Lab Series.